Whether you are an entrepreneur, a farmer, a food processor or a small business transitioning to commercialization, the University of Maine’s Food Pilot Plant may be a resource for you. Located in Hitchner Hall, the Dr. Matthew Highlands Food Pilot Plant offers services to enhance product lines, create value-added foods or scale up recipes for commercial production. 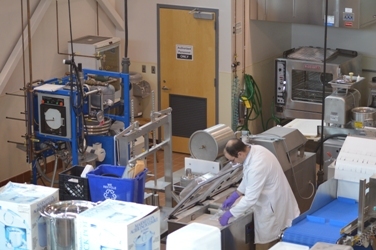 The state-of-the-art research facility is equipped with a variety of food processing equipment, including a pasta maker, meat chopper, dehydrator, blast freezer, steam cooker, cheese making equipment and packaging equipment. In addition, the facility contains a state-licensed commercial kitchen that serves as a teaching laboratory for food-science and human-nutrition students, and as a place where home businesses can package and produce food products. In this video, plant manager Michael Murphy talks about the commercial kitchen and some of the equipment available at the plant. The Dr. Matthew Highlands Pilot Plant is a state of the art facility committed to helping Food Processors, Entrepreneurs, Farmers, Researchers and Students in the food industry. Our equipment and services offer a variety of options for anyone seeking to expand product lines, create value added foods, solve issues in current food products, and scale up recipes for commercial production. Click here for a list of our processing equipment. Price range for use of the pilot plant is $40-$80 per hour depending on the complexity of the project. For more details please contact the Pilot Plant Manager. Clients external to the University of Maine, please contact Dr. Sue Sullivan (207-581-3029, susans@maine.edu). Clients internal to the University of Maine, please contact Dr. Denise Skonberg (1-1639, denise.skonberg@maine.edu). The faculty and staff in the research cluster of Food Science and Human Nutrition do not analyze foods for bacterial or other types of contamination in response to consumer food complaints. If you are a consumer and have a food complaint, you should contact the Maine Department of Agriculture, Food and Rural Resources Division of Regulations at Tel: 207.287.3841.